The ST-HD-VC video converter has been designed to accept a single HD-Coaxinator CVI signal and provide four individual outputs in four different formats. A single HD-CVI BNC video input is processed to provide one HD-CVI output (BNC), one CVBS output (BNC), one HDMI output and one VGA output. The ST-HD-VC is perfect for converting an HD-CVI video source to an HDMI, VGA or CVBS signal to allow viewing at a monitor that does not have an HD-CVI input. 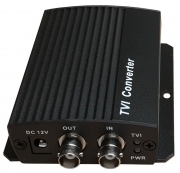 The ST-TVI-VC video converter has been designed to accept a single HD-TVI signal and provide one HDMI output and one HD-TVI (BNC) output. The ST-TVI-VC is perfect for converting an HD-TVI video source to an HDMI signal to allow for viewing on a monitor that does not have an HD-TVI input, such as spot monitoring (a secondary monitor which connects directly to the camera and displays its image, commonly seen in retail store entrances). Many HD-TVI recorders do not have a spot monitor output built-in, and the ST-TVI-VC can be sold separately to provide this function if it is required for a customer’s application. VGA to baseband video converter. Converts a VGA signal from a PC to a baseband video signal that can be viewed on a monitor or television with an S-Video or RCA input.